Fairy Tales; what are your kids Reading? Fairy tales are one of the best parts of our childhood. We grow up reading those tales and even remember them once we are old enough to be parents and grandparents. The enchanting tales of beautiful princesses, prince charming, fairies, gnomes, ugly witches and cruel stepmothers leaves lasting marks on our memories. 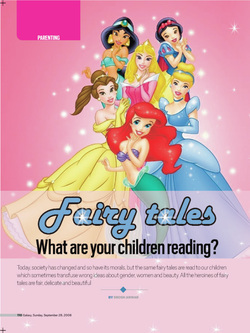 These fairy tales are the best way of instilling morals in our child's mind in a fascinating way. But one thing which we always forget is that, these stories are not from some fairy land but it’s the creation of the human mind. And however impartial a human may become, it is impossible to get rid of the prejudices instilled in one's mind through the rules and norms of the society. We hold and practice these biases without even realizing that we are doing it because this comes naturally to us. As I read the fairy tales as a grown up, I was intrigued that weather these tales are really for the novice mind of a kid? Because some of the themes in fairy tales seemed really harsh for the kids to grasp. Some research proved that fairy tales were never meant for children. They were a form of adult entertainment at social gatherings, spinning rooms, fields and other settings where adult meet. It was not until the end of 17th century that people like Brother Grimm started collecting and compiling fairy tales from all over Europe in the short and comprehensive form for the kids. In the later years, Hans Andersen emerged as a famous fairy tale writer for the children. His stories like The Little Mermaid, Snow Queen, The Princess on the Pea are still read all around the world. Most of these fairy tales were written at a time when women were oppressed and expected to fulfill the preconceived notions of self righteousness and virtue. The greatest asset which a woman could possess was her beauty, chastity, daintiness and submissiveness. One's which did not fit the criteria are always shown as evil, ugly portrayed as step mothers, witches and sorcerers. In almost all the famed fairy tales, there is a princess who is angelically beautiful and her only aim in life is to be silent, patient, and chaste and wait for her prince charming to rescue her from her troubled life. In the world-wide acclaimed snow white, the princess is described as: “the queen gives birth to a baby girl who has skin white as snow, lips red as blood, and hair black as ebony. They name her Princess Snow White.” In “The Little Mermaid”, she is described as “There were six lovely children but the youngest was the fairest of them all. Her skin was as clear and opalescent as a rose petal. Her eyes were as blue as the deepest sea”. The greatest treasure of the little mermaid was her beautiful voice. But in this story she gives up her beautiful voice for the love of a Mortal. In the original version written by Hans Andersen, the prince deserts the little mermaid at the end. The plot and ending of the story is not suitable for a child's mind and it also gives a really negative portrayal of women. Today, the society has changed and so its morals, but the same fairy tales are read to our children which sometimes transfuse wrong ideas about gender, women, beauty and society. All the heroines of fairy tales are fair, delicate and angelically beautiful. The little girls who read these stories may develop complexes in event they are not physically as attractive as described in these tales of far off land. On the other hand the kids may develop prejudices against other kids who are not beautiful according to these standards or they may develop wrong ideas about gender and their roles in the society.